Our skin is our biggest organ and is capable of absorbing a surprisingly large amount of what we put on it. Let us give you all the information you need to know about natural shaving products and hopw to incorporate them into your naturally healthier home. For many people, the daily shave is part of their routine. The set up for their day, the face they want to show the world. Clean, clear, and ready to rock. Unfortunately, many over-the-counter products contain potentially harmful chemicals that may not be good for your skin, your health, or the world in general. Scary stuff!! Here’s more info on what ingredients to avoid and how to find safer, organic, earth-friendly products to use in your quest for a natural shave. Shaving cream helps create a layer of protection between the razor and the face. 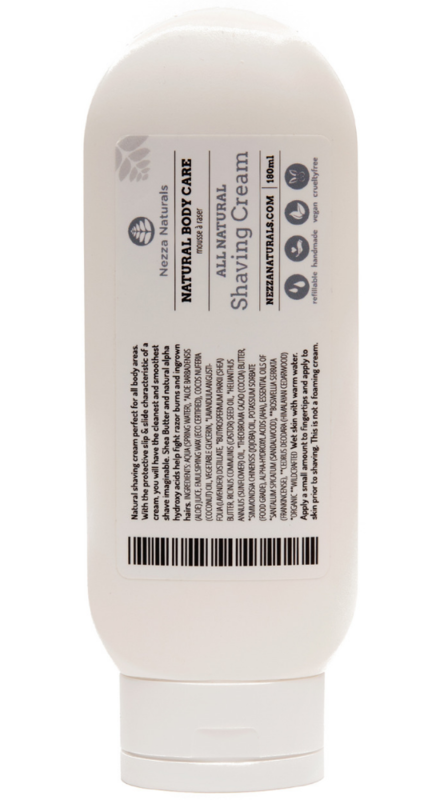 This is intended to create less friction, therefore less irritation, nicks, cuts, razor burn and redness. A smoother shave can help reduce the occurrence of acne by keeping the skin moisturized and damage-free. There are many options when it comes to shaving products. Foams, creams, gels, soaps, oils, and more! Like most household items, it seems the most popular kind is the one which comes in a can. Already, this should be ringing alarms! The canned variety is usually fairly inexpensive and filled with unpronounceable ingredients. Not a good sign. Unfortunately, it does seem that there is a correlation between the purity and simplicity of the ingredients of the formula compared to the price of the product. Not to fear! While there are still many high production companies pumping out shaving cream with ingredients which are difficult to wrap our heads around, emerging into the light are plenty of natural, organic, sustainably sourced, cruelty-free options. It’s worth your time to determine if what you are putting on your skin and into the water is doing more damage than good. 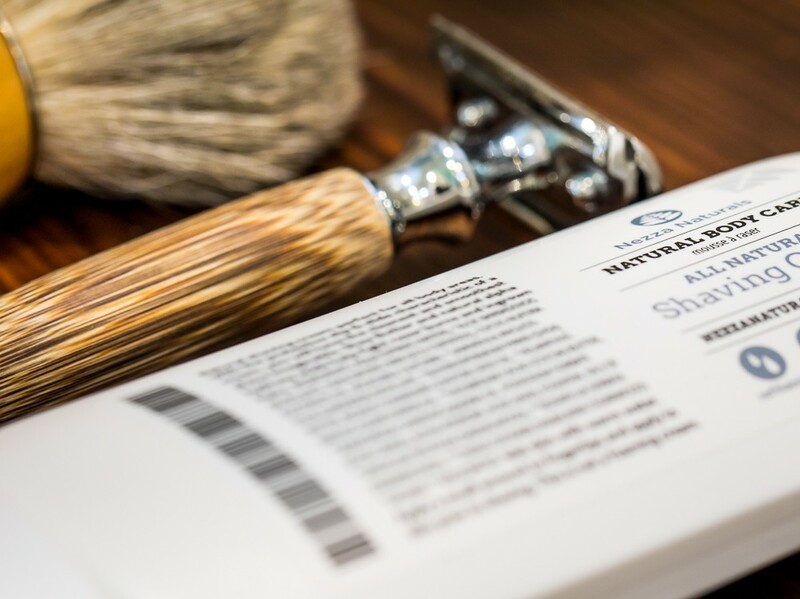 As far as conventional shaving creams go, there is a fairly standard blend of ingredients used. A typical can is filled with about 80 percent water, along with a bunch of other ingredients intended to lock in moisture, emulsify, create lather, and propel the mixture out of the can. Let’s uncover what these ingredients are really about. Propylene glycol is a humectant (meaning moisture-locking) like glycerin, but unlike glycerin, it's more frequently found in antifreeze and brake fluid. It is used as a solvent to mix artificial colours and fragrances, oil and water bases. Triethanolamine (TEA) and its cousins, Diethanolamine (DEA) and Monoethanolamine (MEA) are emulsifying agents. This means it helps to combine water and oil, keeping it from separating. It is a controversial ingredient in the skincare industry not only because it causes skin irritation, but many products containing triethanolamine are found to also contain nitrosamines, which are linked to cancer and hormone disruption. Eek! As another warning, TEA, MEA, and DEA are banned in Europe. According to the Environmental Working Group's Skin Deep Cosmetic Safety Database, SLS is a "moderate hazard" that has been linked to cancer, neurotoxicity, organ toxicity, skin irritation and endocrine disruption. It strips skin of its natural oils which can trigger dermatitis, allergic reactions, acne, and dry skin. SLS mimics estrogen, which is especially problematic for women. SLES is known to be contaminated with measurable amounts of ethylene oxide, a known human carcinogen. Ethylene can harm the nervous system and is classified as a developmental toxicant as it can interfere with human development. SLES also often hosts another known carcinogen called dioxane. 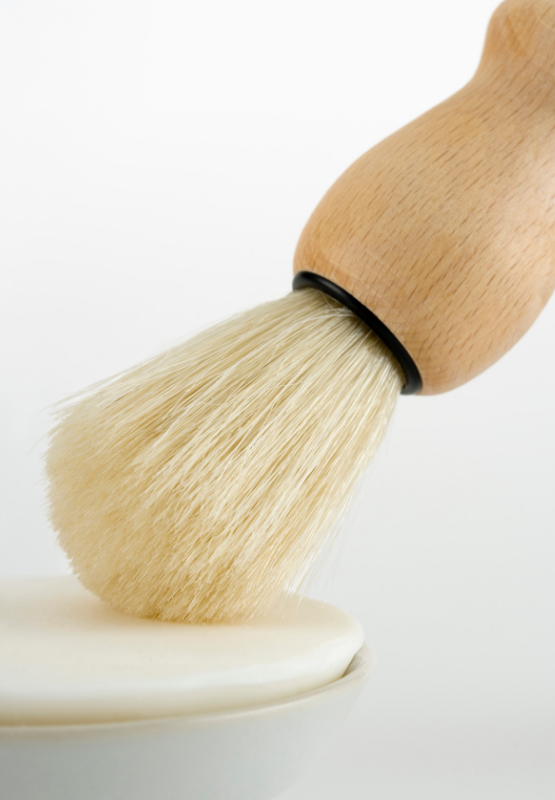 Water, (Aqua) is the main ingredient in most shaving creams. The ones you want to search out contain botanicals with soothing, smoothing properties listed right up there next to water on the ingredients list. Fragrance should be naturally sourced, preferably from essential oils and botanicals. Stay away from synthetic fragrance, hands down! For a natural shave to leave your face happy, look to the following skin-loving ingredients and their benefits. Chamomile- natural anti-inflammatory and is well-known for its skin calming properties. Marshmallow- a natural anti-irritant and anti-inflammatory, which helps prevent razor burn. Aloe- cooling and soothing on the skin. Promotes healing for any nicks and cuts. Calendula- helps ease the discomfort from minor burns and cuts, which are common during shaving. Evening primrose- another anti-inflammatory that also helps deal with itchiness. Glycerin- a humectant that draws water into your skin to help keep it moisturized. Prevents skin from drying out. Plant Based oils- sesame, olive and coconut. These natural oils are great for keeping facial skin soft and supple. How to find better natural shaving products? Here are some tips for finding more natural products. With the right information, you can save yourself from all the chemical nasties malingering out there. Follow these tips when purchasing items or ingredients to make it yourself. It really isn’t difficult to protect yourself and your family by using natural, organic, sustainably sourced and cruelty-free products. This is a big one. Turn the product over and read the back. The marketing team knows consumers are focused on finding healthier alternatives. They may strongly advertise the fact that there is essential oil in the products when there may only be the smallest amount included! Very tricky. Producers are legally bound to list the ingredients in a product from the highest used to the least used. In any product, the first 4-5 ingredients make up the majority of the formula. Focus on these first listed ingredients and it will give you a good overview of the product as a whole. DIY solutions are fun to create and can be customized once you know what you are doing. Include only the best natural ingredients and your skin will be singing! Search for naturally sourced, moisturizing oils. Some favourites to make your skin soft and supple are: jojoba, coconut, olive, shea butter, cocoa butter, sesame, hemp seed, avocado, and macadamia. Manufacturers have caught on that we don’t like nasties in our skincare products. Look for words like: No Fillers. No Artificial Fragrance. No Parabens. Not Tested on Animals. No Propylene Glycol. Do some research for the man in your life, look up your favourite organic or natural skincare brand and see if they have also created a line of specialized men care and shaving products. It’s a good place to start the search!